Despite its attempts to predict the future, I'm generally a fan of the Wall Street Journal; I know of no other publication that so succinctly and clearly gives you the day's most important business news. People who read the WSJ thinking they're getting an edge on where the markets are headed couldn't be more self-deceiving, but if you're just looking for the basics of what happened in the markets, you'd be hard pressed, in my mind, to find a much better source. Also, for those scant of us who follow commodities, the WSJ is one of the few places I know among major media outlets that actually gives page space to the markets (albeit succinctly and usually on the back of section C). Okay, now, with that caveat out of the way, I have to say that yesterday's article: "Traders Bet on an Oil Breakout," which purports to be the day's "Commodities Report" is unquestionably one of the most shallow, poorly researched, amateurish articles I have ever read. Anywhere. In my life. "Traders Bet on an Oil Breakout"
"Since October, prices [of oil] have largely ranged from $70 to $80 a barrel, the narrowest four-month band since mid-2007. An oil "fear gauge"—the CBOE Crude Oil Volatility Index—early last week fell to the lowest level in more than two years. But in the past few sessions, trading in the crude-oil options market has shown signs of reviving... While oil prices remain within that trading band, the volatility index has bounced off the bottom, according to some traders." See that big, significant bounce way down at the end there? Neither do I. It looks much more like random movements typical of every single market everywhere on the planet since the invention of markets. Which traders claimed the volatility index has jumped off the bottom? Oh right, some traders. "New swings, either up or down, likely will be triggered by expected changes in supply or demand. Some expect oil prices to tumble, taking a cue from last week's selloff in stocks, which fell on fears of another downturn in the global economy. Others say prices will soar because of stronger economic growth and fuel consumption." The rest of the article goes on to talk about the proposed oil position limits by the CFTC (which I've previously discussed at length) and how they've caused some speculators to exit the market. This second half, so to speak, in its own right is actually a reasonable bit of reporting, but it certainly doesn't belong under this headline of "Traders [Betting] on an Oil Breakout". It's sort of like reading two different articles, one written by a reporter, and one written by that reporter's (admittedly precocious) 9 year old child. What could have been improved? Other than "everything", this article is essentially three different articles, none of which is actually meaningful in its current incarnation. If this were an article discussing the signs pointing to a return to volatility in the oil market (as the headline purports) then a lot more work should have been done to determine if that "bounce" in the CBOE Volatility Index reported by some traders as the bottom is the result of explicit returns to the market by speculators and/or hedgers, or if it's just random noise. There is a mention in the article that Southwest Airlines, Newfield Exploration Co, and Chesapeake Energy all "recently" increased their hedging positions. If the CBOE volatility index increase is the result of hedgers taking greater positions, that implies less volatility than if these were speculators reentering the market. Do some reporting and figure out which it was. If, on the other hand, the article were to focus on this crazy "supply and demand" theory that's been posited by the author, it should actually show some trends and figures for supply and demand. 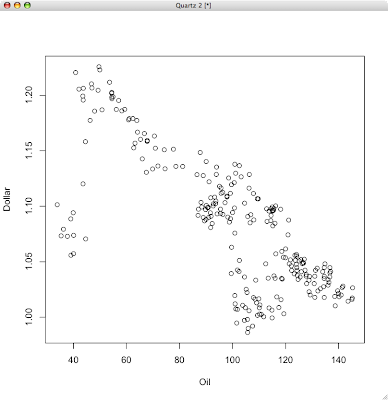 Is there a correlation between oil reserve estimations and volatility? How have global import/export numbers looked for 2009? What do the fundamentals suggest? And lastly, if instead the article were to focus on the proposed CFTC regulations, maybe it could talk about how those regulations will affect volatility. The article ends with a quote from the global head of energy trading a Société Générale (a European corporate bank I've never heard of) talking about why hedging is important for companies that produce and consume oil. This is altogether worthless information. Of course hedging is important for companies that produce and consume oil. A better, more meaningful question to end the article would have been: "If enacted, how do you imagine the CFTC imposed position limits on speculators will affect volatility and/or liquidity? What does your bank plan to do if these limits are enacted?" At least then we would have seen an opinion that may provide insight into the the current state of the market. Seriously Wall Street Journal, proofreading means more than checking for spelling or grammatical mistakes. In Ancient Rome, an ounce of gold would buy you the nicest hand woven cloth garment, likely died a beautiful and uncommon color. In Viking times, an ounce of gold would buy you a coat of soft, warm, and sturdy furs well made and stitched together with intricate designs and fastened with beautiful artisanal leather work. In the Wild West, an ounce of gold would buy you a Wyatt Earp type three piece suit with a frilly shirt imported from France and a perfectly steamed fur-felt cowboy hat. Today, an ounce of gold will buy you a beautiful, custom tailored Armani suit with a silk neck tie. The weighting of the currencies, though based on real economic data, is somewhat arbitrary. Currently for example, 57.6% of the weighting falls to the Euro, as it was determined that that percentage is how much the dollar is affected by that currency. If geopolitical relationships were to change at all, that 57.6% (or any other weighting) becomes less meaningful. Since most of what I'm writing about concerns comparisons of the dollar's strength with commodity values, I need a barometer that can gauge the dollar's worth in global commerce. Surprisingly, the USDX is not the index used to gauge how strong the dollar is in global trade; that honor falls to the Trade-Weighted US Dollar Index, which is a basket of about 27 or so foreign currencies, weighted by trade volume with the United States, and adjusted annually as trade volumes change year to year. You might think that this index would make a better currency barometer, but the fact that it's changing every single year actually makes it difficult to use when gauging long-term trends. Within a single year it's great, but otherwise you run into consistency problems. This is a bit more of an aesthetic reason, but the USDX is not a real currency. Like all indices, it had to be assigned an arbitrary starting value on a given date which, in this case, happens to be 100 as of March, 1973. So, when I read that the USDX is trading at 78, that means that the dollar is 22% weaker today against an oddly weighted basket of currencies than it was in March 1973. Sweet, good to know. No, when considering the value of the dollar, I want a tangible gauge. I want to know how many units of another nation's currency my hard-earned greenback will actually buy me. I can't walk into a bank tomorrow and say: "I'd like to exchange $100 for 57.8% Euros, 13.6% Yen, 11.9% Pounds Sterling, etc. etc." Well, I guess I could, but I'd look like an idiot. All of that explains why I prefer not to use the USDX, but why the Swiss Franc? The nation of Switzerland has basically two major economic sectors (three if you count cheese with holes in it): high-end watches, and banking. The country is essentially a giant bank. Its historic neutrality protects it from major geopolitical upheaval and it's terrain makes it largely impenetrable in the event of a new world conflict. Its vast stores of gold give the economy a fundamental and irrefutable value, while its conservative approach to asset management make it's currency extremely stable. Because of Switzerland's limited industrial focus, the United States will almost never be in any sort of trade dispute with the country, unlike, say, with the EU, Japan, China, England, or even Canada, where trade relationships are intricate and new regulations, national or international, can have more dramatic effects on currency values. Because of Switzerland's unique status on the world stage, its exchange rate with the dollar truly lets you know how much the dollar is worth to the rest of the world. I've been to Switzerland twice, it's a beautiful country, one I hope to return to some day. On my most recent trip there (in 2005) I held onto a SFr 5.00 coin, which today sits on my night stand and which I'll occasionally throw into my pocket if I need a bit of good luck. It is my favorite piece of legal tender I've ever possessed; hefty but not too bulky with beautiful engraving on each side. At the time I acquired it, the coin was worth about $3.85, as of this writing, it's worth about $4.80. Given what's happened to the US Economy between 2005 and 2010, that seems just about right. That is some crazy volatility, and it has almost everything to do with weather forecasts. Though natural gas could be used to do just about everything oil does, currently, the cleaner burning fuel is used primarily for heating homes and other buildings. As such, during the winter months, when people are burning a lot more natural gas just to stay warm, the price can be driven by minor changes in the local weatherman's ten day forecast. In the summer, by contrast, Natural Gas is much more likely to follow energy patterns in general, and be driven by the same things that oil prices are driven by (reserves, projected refining capacity, projected demand, currency effects etc. etc.). I can just imagine natural gas speculators listening to the weatherman's tone before he actually announces the forecast, trying to get some glint of an overarching mood: upbeat means sell, foreboding means buy. Those who bought natural gas expecting the price to go up, no doubt, must become furious when the weatherman announces, jubilantly, that "this weekend's not going to be nearly as cold as we thought," with some sort of big, game show host smile. By contrast, when the forecast is worse than expected, natural gas bulls likely experience a kind of odd schadenfreude, delighting at the weatherman's gloomy and altogether dejected countenance as he warns his viewers to stay inside where it's warm. Truly, by literal definition, the weatherman is the natural gas investor's nemesis. By the same token, I've got to imagine natural gas sellers are quick to send the weatherman flowers when the forecast's got him down. Obviously in the winter you'd expect prices to go up and in the summer to go down; in fact, there are whole businesses built around simply buying gas in March, pumping it into a salt cavity in the ground, and then selling it in November at much higher price. Why I find this so interesting, however is that the nature of the natural gas market changes every year from your typical energy market in the mild months, to a crazy spot market when the weather's cold. Look at that divergence. It's as though people are buying natural gas to, you know, use it. Winter month natural gas prices are a perfect example of when a commodity market actually does its job: establishing prices for commodities. A word of advice to any tri-state weathermen out there: stay away from the NYMEX building, unless you're looking for a fight. Commodities 101: How does one invest in commodities? This post is part of Asset Prime's "Commodities 101" series. The most direct way to invest in commodities would be to actually buy or sell the tangible goods themselves. You know, like growing your own Soybeans and then selling them to a grain elevator, or renting space in a meat locker and filling it with Frozen Pork Bellies, or melting down old pop cans and casting the aluminum into ingots and then hoarding those ingots until Aluminum prices rise. If you're not quite up to that level of commitment, fortunately there are myriad financial instruments at your disposal to get you going. One of the easiest ways to invest in commodities, particularly for folks already familiar with equity trading, is to buy and sell the stock of corporations whose earnings rely heavily on commodities prices. Think gold prices are going up? Buy stock in Barrick Gold (ABX) or Harmony Gold Mining (HMY). Think Lumber prices are going down? Buy stock in home construction companies such as Toll Brothers (TOL), or maybe sell lumber producers like Plum Creek Timber (PCL) and Weyerhaeuser (WY) short. Got a hunch about Corn? Buy or sell Archer Daniel's Midland (ADM) and/or General Mills (GIS). The major drawback of this approach is that all corporations have factors other than commodities prices dictating their stock performance, so that the change in a commodity's price may not cause the desired effect in the stock price. Another option would be buying or selling shares of mutual funds, index funds, or ETFs that seek to somehow track the prices of individual commodities or some basket thereof. These instruments, that typically trade like stocks on the major exchanges, are all relatively new to the investment world and each has its own unique means of "achieving" its price goals. Some buy the underlying physical commodities and keep them in storage, others hold futures contracts at a certain specified leverage, still others have more exotic ways of attempting to track the underlying commodities. While these instruments may be a good option for some investors, in general, there is a gap between the price movements of these funds and those of the underlying commodities, usually the result of the expenses of maintaining and managing the funds, or liquidity problems with the instruments. Until practical physics and/or electrical engineers devise a better battery, lithium-ion is the power-source of choice for the ever-growing electrification of our automobiles. The batteries are going to become more efficient, more compact, with larger capacity and a longer life, and within ten years they're going to be integrated into the engines of every car that rolls off the assembly line. And all the auto industry needs to accomplish this is firm resolve, technical knowhow, and 700 million tons of lithium. The Wall Street Journal today reports that Toyota Motor Corporation secured access to a long-term lithium source in Argentina, outbidding potential Chinese buyers. As lithium increasingly becomes an input into our transportation and energy industries, demand for the metal is going to skyrocket, as will the number of mining operations seeking to acquire and sell it, making the price about as volatile as the element. * If the auto/battery/lithium mining industrial complex is going to maintain any semblance of sanity there will need to be a hedge for producers and consumers of lithium. This is the same thing that happened with palladium, a metal used almost exclusively in the production of catalytic converters, when wild price swings pre-futures contract made establishing budgets and allocating funds close to impossible for automotive manufacturers. A listed futures contract will afford automakers a relative stability when it comes to protecting themselves. I'd put the over/under at about four years before a contract is listed on either the LME or the COMEX (or both). Any takers out there? *As an unfortunate side effect, look for these sorts of chemical/financial volatility puns to be used in 100% of news stories related to lithium price movements. Commodities are the basic goods upon which businesses, economies, indeed entire civilizations rely for their continued existence. In the investing world, the term refers to a specific set of about forty or so products used as the primary inputs in the world's major industries. As a rule, they are fungible and generic; a batch of a given commodity harvested in Wisconsin ought to be just as useful as a batch of that same commodity harvested in Brazil. With very few exceptions (the most notable being gold), all commodities end up getting used for something, whether it's building houses, powering nuclear reactors, or feeding cows. Metals - These include the precious metals, such as gold, silver, and platinum; as well as non-precious, industrial metals like copper and aluminum. Grains - Just like it sounds, grains include wheat, oats, barley, rice, corn and soybeans. Meats - Livestock, such as pigs and cows, as well as animal products like milk and butter. Energy - The inputs needed to power engines, generators, and the like. This includes crude oil and its various refinements, as well as natural gas, ethanol, and uranium. Softs - A hodgepodge of "other" commodities, includes cocoa, coffee, sugar, cotton, orange juice, and lumber. The term used to refer to tropical, agricultural commodities, but for whatever reason Pacific Northwestern wood products were thrown into the category. Depending on where you get your news, you may see people divide metals into precious and non, refer to grains and oilseeds separately, make finer distinctions in energy, or break wood products out of the softs, but for the most part, those are the types of commodities that exist in the financial world, and they are the basis of the entire global economy. As a follow up to my post on Friday about how the CFTC's proposed oil and gas position limits are ultimately wrongheaded, I wanted to talk a bit more about why position limits won't solve the problem, and why these regulations are ultimately bad for the markets they are supposedly trying to protect. As I said in Friday's post, the problem is not position size, but leverage. And the reason leverage is a problem is that small market moves are amplified by virtue of the buying and selling that NECESSARILY must follow when positions are entered into via margin. To understand this, first, consider that unlike a stock every futures contract is entered into by two individual parties. There is no corporate entity issuing these contracts to raise capital as is the case in the stock market. Further, the commodities do not necessarily have to even exist for the contract to be initiated. Today, I could "sell" you 5,000 bushels of oats to be delivered in September. Never mind that I live nowhere near an oat farm, let alone the Chicago warehouse to which those oats would be delivered. No, as an investor, I would be selling you those oats with the intention of buying the same amount of oats from someone else later to offset my position, hopefully at a lower price than the one I gave you. My bet is that the price oats will go down between now and September. Your bet is that the price of oats will go up. Thus, for every futures contract that exists, there is a bullish participant, and a bearish participant. The bullish participant (the buyer) expects the value of the underlying commodity to go up, or at the very least, to NOT go down. The bearish participant expects the price to go down, or at least to NOT go up. In every trade, someone is wrong and someone is right. Now, back to the point at hand, by virtue of the fact that someone wins and someone loses on ANY price movement, the dramatic effects of leverage can work like a positive feedback loop. Commodities exchanges and financial institutions facilitating futures trading require that a certain amount of money be maintained in an account to maintain one's position. This is called the "maintenance margin" and adverse price movements can wipe you out, initiating a "margin call" where the exchange or brokerage requires you put up more money or else exit the position. Let's take a concrete example with a fake commodity. Assume there are two speculators: Albert and Brian. Each of whom has $10,000 he'd like to invest in Widget futures, currently trading at $20 a box with one Widget contract equal to 500 boxes, making the total value of one Widget contract $10,000 (convenient, eh?). The exchange requires a minimum margin of $1000 per contract. Albert, the more risk averse of the two, buys exactly one contract. Brian, seeking to amplify his gains, buys ten contracts. Albert is not leveraged whatsoever, whereas Brian is as leveraged as possible. The next day, the price of Widgets falls from $20/box to $19/box. Albert is now down $500, whereas Brian is down $5000 (–$500 x 10 contracts = –$5000). Since Brian has fallen below the margin requirement of $1000 per contract, his broker tells him he must either add another $5000 to his account, or else exit his position. Having no more funds to allocate, Brian tries to sell his Widget contracts (all ten of them) to exit his position. However, because the price has gone down, many other investors are also trying to sell their Widget contracts, having received margin calls from their brokers. The flood of sell orders drives the price of widgets even lower. Eventually, some buyers enter the market at the deep discount of $18 / box, and this is the price at which Brian is forced to sell. Now, at $18 / box, Albert has lost a net of $1000, while Brian has lost every last penny. Incidentally, Albert (always patient) can wait for the price to go up, as he knows these sorts of market hiccups are to be expected. Brian, meanwhile, moves all of the rest of his money into T-Bills. Oil was moving more or less sideways until February 2008. At which point, a perfect storm of geopolitical factors began driving oil prices up. As oil continued up, the bearish speculators (those who had sold oil) had to cover their positions as they were losing money. Some, certainly, received margin calls. Because they were leveraged they did not have the luxury to wait for prices to go back down to exit their positions. A flood of buy orders only served to drive prices higher until they reached the ludicrous peak of $140 / barrel, at which point, investors realized that was insane and began to sell crude like crazy. Those who had continued to buy oil all the way up to $140 now found themselves awash in sell orders and, because they too were incredibly leveraged, these folks were forced to cover their positions as oil went down, all the way through the public awareness of the credit crisis (how apropos) and into March of 2009, when sensibility and prudence (purely the product of fear) finally began to return to the market. Would position limits have caused things to go any differently? Absolutely not. If anything, limiting the number of positions people or institutions can hold would have had an even worse effect by stifling the liquidity of the market. The problem is not position size, the problem is leverage. Now, admittedly, when large financial institutions take massive speculative positions in the market they somewhat amplify the problem. (Consider some hedge fund with 1000 Oil contracts all maximally leveraged suddenly getting a margin call; you now have 1000 more sell orders than you did five seconds ago.) But limiting leverage would in effect also limit position size. If your firm has $1,000,000 to deploy on oil contracts, and the margin requirements were $10,000 instead of $5000 per contract, the firm could buy only 100 contracts, rather than 200 under the lower margin. This would also give the firm much more breathing room, so to speak, when prices move against them. Margin calls would be fewer and further between for EVERYONE. One last caveat, the margin problem is not so much with individual investors buying an oil contract here or there on margin, but with big firms buying hundreds of oil contracts on the smallest allowable margin. Were I king of the CFTC, I'd impose a sliding margin requirement based on number of contracts. Something like, say, a 10% increase on minimum margin for each speculative position entered into past the 10th. Of course, lawmakers would rather their restrictions meet the populist demands than actually make sense from an economic point of view. My advice? Stay the hell away from any index fund or ETF that tracks oil or gas. If these regulations go through, energy commodity funds are due for a liquidity shock, and some market maker will happily arbitrage your money right out of the fund. "So, how DO you keep your trades on a leash?" Before entering any position I determine how much money I'm going to allocate. Because of the relatively low margin, compared to a futures contract's true value, I always try to overshoot the margin requirement by a substantial amount. My target is to allocate at least enough money so that I'm operating at an effective leverage of 75% or less. The volatility of the market, in my opinion, makes being as leveraged as possible horrendously risky. Immediately upon entering a new position, I determine my maximum loss. For me, my personal rule, is 20%. That is to say, I refuse to lose more than 20% on any given trade. I do some math and determine at what price I'll have lost 20% of my allocated funds, and set that as a stop with my broker (a buy stop if I'm short, a sell stop if I'm long). As a personal rule, I will NEVER move this stop away from my position (that is to say a 20% loss is truly my personal maximum). Throughout the day, I alter my stop order if the price has moved in my favor. Unless I have new research to strongly suggest otherwise, I do not alter my limit price whatsoever. Here's an example with a fictional commodity. Suppose I want to go long on March Widgets, which have a contract size of 5000 boxes at a price of $1.00 / box. My broker requires an initial margin of $1000 to enter into this contract. I decide that I will be allocating $2000 to the trade, for an effective leverage of 60% (I'm only buying one contract). To lose 20% of my $2000 investment, the total value of the contract would have to decrease by $400, which means a decrease in price of 8¢ ( [$1.00 * 5000] - [$.92 * 5000] = $400 ) Thus, I would set a sell stop at $.92 / box. From my research, I expect widgets to go up as high as $1.10 / box. I then set a sell limit at $1.10. Throughout the day I am constantly checking the current price of Widgets. If the price ever goes up, I move my sell stop up accordingly (whatever amount would result in a 20% loss from wherever the price currently is). This continues until I either get stopped out, or until Widgets hit my limit price, whichever comes first. Some of you may have noticed that what I'm describing regarding moving the stop order is technically a "trailing stop" and many brokerages allow you to do this automatically (the stop order moves to some percent above or below whatever the price is currently). Personally, though my brokerage allows it, I do not use this sort of automation. The reason is that, as I've discussed before, the market may make a weird hiccup out of nowhere and then go back to normal trading. Such a hiccup might, if your trailing stop was automated, move your stop up or down, then immediately stop you out at a loss before going back to whatever the price was before. However, since I don't move my limit, if that hiccup happens to trigger my limit order, I'll happily take the money, thank you very much. *That advice was: "Don't worry about trying to be exactly right. If you're basically right most of the time, that's much better than being exactly right occasionally." "While yesterday's proposal is a step in the right direction, we are concerned that the proposed limits may be too high to rein in damaging speculation in oil and gas markets," John Diamond, a spokesman for Senator Maria Cantwell, said. Cantwell, a Democrat, has been a vocal proponent of increased energy market oversight and introduced legislation that would have forced CFTC to set position limits. "The CFTC must set the limits at a level that does not allow excessively high speculative positions that ultimately harm energy consumers," her spokesman said. The question as to what, specifically, is damaging about oil speculation remains to be answered by Ms. Cantwell. So let me help you out. The answer is nothing. Nothing is damaging about speculation in it's own right. What is damaging, however, is leverage. As I discussed in a recent post, the amount of leverage extended to commodities investors (in the form of margin) is absolutely insane. If you think about who the market is supposed to serve (producers and consumers of commodities) that kind of margin makes sense; if you're an oat farmer, you probably can't afford to buy or sell 5000 bushels of oats as a hedge against your own crop that has yet to be harvested, but an exchange can be pretty certain that that oat farmer will either have liquidated his position or else deliver on his contract once trading ceases. The man is an oat farmer for God's sake. He shouldn't have much trouble finding some oats. If you think about it as credit, and if the currency of your credit is oats, then I'll be damned if you can find a better candidate to whom to extend that credit than an oat farmer. You might think, then, that the easy solution is to remove speculators from the commodities markets entirely. Sounds fine at first, but that really ends up screwing over the actual producers and consumers of the goods. These folks NEED speculators in the market to provide liquidity and ensure no one can unfairly corner the market. Think of it as market transparency taken to its utmost extreme. No, the real problem is that there is no reason at all why speculators should be extended equivalent amounts of credit with which to move contracts around. You think some hedge fund manager in New York plans to drive a semi up to the NYMEX warehouse to pick up his 1000 barrels of West Texas Intermediate? No of course not, he'd probably get his suit dirty, and that suit cost more money than his margin on the oil contract. If a firm (a hedge fund, index fund, etf, etc.) has say, $1 milllion to deploy on oil contracts, they can effectively buy or sell about 200 contracts, the equivalent of between $15 and $16 million worth of oil (assuming oil is at $75 - $80 / barrel). It's this kind of margin insanity that encourages wild and irresponsible speculation. Limits on the number of contracts you control are meaningless unless you make people accountable for the costs of those contracts. What's that? Oh right. The actual limit. This law would set the maximum amount of contracts a trader could control at ~98,000, which works out to be about $7.5 billion worth of oil. So, look for that to affect, I don't know, Scrooge McDuck. Most people who start trading futures after having spent some time in the stock market expect the former to be like the latter. These people are usually in for a rude awakening. Intense volatility coupled with rock bottom margin requirements conflate to create a market environment not unlike a hurricane. In stocks, unless your're playing those crazy Russian IPOs with zero volume, a 5% swing might typically be a big day. In futures, a 5% price swing might mean the entirety of your life savings. Let's take Lumber, for example. North American Softwood Lumber Futures (Random Length) are traded on the Chicago Mercantile Exchange and are priced in dollars per thousand board feet, one contract is equal to one hundred and ten thousand board feet. (Fun fact, 110 thousand board feet is exactly the amount of lumber that will fit in a boxcar. It's true, some guy told me that one time.) As of this writing, the front month (January) Lumber contract istrading at ~$220 per thousand board feet. That means that the net value of one contract of North American Softwood Lumber is $24,200. And yet, if you'd like to buy or sell one of these contracts, all you need to put up is ~$1800 (give or take, depends on your broker). So, today, with less than $2000, Joe Schmo can control nearly $25,000 worth of Lumber. That's an effective margin of 92%. Now, assume Joe is long 1 lumber contract, and the price moves down 5% to ~$209/mmBF. That 5% change is equivalent to a loss of $1210. Assuming Joe only put up $1800 to buy that contract, that leaves him down a whopping 67% on his initial investment, after only a 5% change in price. And remember, that's assuming he bought only one contract. Ouch. What the hell is that? I mean, seriously, is that a prank? Oil opened the day at about $80.50 and closed the day essentially flat at about $80.35 per barrel. There was no news about oil, no major economic indicators were published, and yet, for some reason, between the hours of 9am and 1pm Eastern time, oil fell to about $78.80 per barrel and then rose back up to $80.75. If you were long March Oil, and only put up the minimum to enter into the contract, that kind of swing could potentially result in a margin call (depending on where you entered your position) immediately before jumping up to a multi-day high. If you were short, and were looking to exit at a price below $80.00, but, say, happened to live on the West Coast, you might be just arriving at work, only to realize upon powering up your computer that you missed the nadir you were looking for. The moral is that when you're investing with futures contracts, you can't sit back and wait to see what the market does once you take a position. You need to remain active, agile, and vigilant. You need predetermined exit points, both to stop a loss AND to realize a gain, and you can't let emotion get the best of you. Despite what your econ professor said, this market is not rational. US Government to Grains Speculators: "You're all idiots"
Grains are notoriously one of the trickiest markets to play. First, the goods themselves are quite fungible. ("Corn too expensive? We'll feed the cows Oats for awhile.") Second, they're vastly interconnected to the prices of NUMEROUS other commodities. ("If Lean Hog prices plummet, we'll stop raising so many pigs, which means we'll need to stop buying feed. ") Third, most US grains are also produced in massive quantities somewhere else in the world, which makes the prices highly susceptible to currency effects. ("Well, it's a record Soybean crop in the midwest with the lowest export demand in history, but the Brazilian Real is the strongest it's ever been. Look for Soybeans to go up.") And fourth, (and this mainly applies to Corn but look for other grains to join the fun in the coming years), the government gives big subsidies to grain producers whose crops go to the creation of Biofuels such as Ethanol. "The government stunned commodity markets by estimating record corn and soybean crops for 2009, sending prices tumbling." I've zoomed in to about a three-week view to exaggerate the effect. Here you see front-month corn prices moving more or less sideways, and then shooting down the daily trading limit yesterday. As of this writing, prices are down a further 3% in today's market session. Is there any reason for the prices to stop their descent? Honestly, I doubt it. Everyone and their mother was yelling about how 2010 was going to be a bull year for commodities, with China growing at a supposedly exponential rate and every other nation firing up its boilers to full post credit crisis. But already in 2010 the situation in China seems to be changing directions. Edward Harrison at CreditWritedowns.com recently had a great article about how the Chinese economy may be more of a bubble than anyone had anticipated, and with the Chinese government's insistence on keeping the value of the Yuan fixed, they're setting themselves up to have a currency as worthless as the one its pegged to (that would be the Dollar). But the bottom line is that if your supply vastly outweighs your demand, no matter what that demand is, the price is going nowhere but down. On the plus side, there'll be no shortage of corn tortillas. Orange juice futures trader Dominick Minervini spent years fending off comparisons to Dan Aykroyd in "Trading Places," the 1983 movie that thrust the tiny market into the public consciousness. "If I said I trade orange juice, everybody would say, 'Oh, it's just like the movie,' " said Mr. Minervini, who has been trading for more than two decades. So how about it Wall Street Journal, do I get a royalty check now? The Onion ran a pretty funny news-in-brief yesterday about Obama waiting for the new Springsteen album to gauge the health of the economy. While obviously satire, this isn't that far off from the work a lot of folks are doing in the realm of crowd sourcing, distributed intelligence, group behavior analysis for gleaning information about complex systems (e.g. world economies). My friend Jack writes a pretty cool blog called "Markets with Search" that examines Google search trends to predict global market behavior. His post on predicting iPhone sales is particularly illuminating as to how one might use this technology, that is freely available to everyone, to do much better jobs of predicting economic figures than what a "professional" analyst will tell you. In the future, when I get a little time, I hope to apply this sort of mass crowd search analysis to commodities fundamentals and prices. Intrigued? I hope so. A major freeze in Florida last week terrified Orange Juice hedgers and speculators alike, with March 2010 Orange Juice opening at 145.5¢ per pound on Friday and going straight up to 151.15¢ per pound to close out trading (always love those candle stick charts where the low is the open and the high is the close). In a scene that I have to imagine was reminiscent of the end of Trading Places, traders on the NYBOT awaited word of the damage from the weekend's deep freeze (Florida's citrus belt fell to temperatures below 25 degrees). When the damage was reported to be not as bad as feared, prices shot down this morning, with the last trade of the session for March 2010 futures at 133.1¢ per pound. This is a classic example of when you should stay the hell away from a commodity unless you're growing/mining/smelting it yourself. Sometimes, you'll see prices go one way or the other because people were afraid that some specific news item might cause some people to anticipate other people acting in a certain way (or some other convoluted garbage). In these cases, you basically have a false or inflated premium built into the price (one way or the other). A great example of this is when computer models predict hurricane season six to eight months out. These models are not anywhere close accurate, yet prediction of a "potentially extreme" or "potentially calm" hurricane season inevitably sends Orange Juice prices way up or down, even though the weather itself (or lack thereof) has yet to do anything to the crop. However, the current situation is the exact opposite. America's oranges nearly froze to death over the weekend. If news post-freeze had turned out that Florida lost half it's crop, prices would have probably broken 170¢ per pound or more. Further, when the situation is this extreme, a lot of the activity in there is the result of action by the hedgers themselves. You know that a lot of Friday's movement had to do with Tropicana and various orange growers taking potentially losing hedging positions just to make sure they didn't go bankrupt if something terrible happened to the crops. Remember, the hedgers, not the speculators, are the reason the futures markets exist in the first place. It's times like these when you're better served by waiting on the sidelines. Personally I'm just glad I'll be able to drink my morning juice next month. As a follow up to my post last Monday, I went ahead and did a little statistical regression analysis on the correlations between Crude Oil and the US Dollar/Swiss Franc exchange rate (my favored dollar value barometer), and compared the 2008 correlations with those of 2009. 2009's plot looks a little bit better. So in the short time of one year, we've seen the correlation between the value of the dollar and the price of oil increase dramatically. 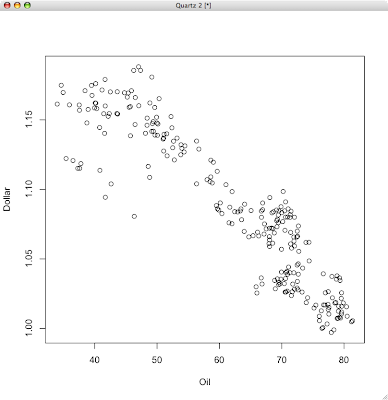 The thing to keep in mind is that with bivariate data such as this, R_Squared doesn't care which variable is dependent upon which, so while today I'm happily discussing how oil prices are affected by the dollar, I could just as well be saying the reverse. And as I've said before, as the global economy grows and emerging powers such as India and China begin consuming greater amounts of oil, it may not be long before we no longer discuss how a strong dollar drove oil prices higher, but rather how skyrocketing global oil prices turned the dollar into a worthless currency. Full Disclosure: Short March 2010 Mini Crude Oil (QMH10) as of writing. Yesterday's WSJ ran a report on how commodities prices appear to be shifting such that they are no longer as closely linked to the US dollar. Historically, as most all commodities are priced in US Dollars (by virtue of their being listed on US Exchanges), there has been an inverse correlation between the strength of the dollar and the prices of commodities; as the value of the dollar goes up, commodities' prices go down. This makes sense, as a weaker dollar means you'd have to use more of those weak dollars to purchase the same amount of some object. "But since the end of November, both the dollar and commodity prices have been gaining ground." 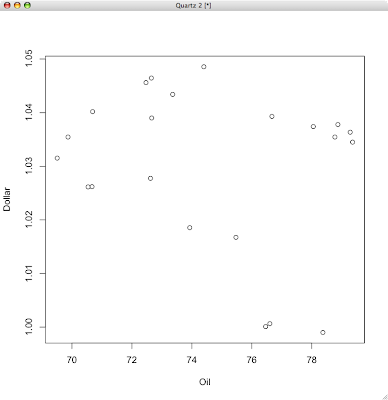 And a full regression analysis yields an R_Squared value of .04717 (adjusted R_squared of -.0004742). So no, Wall Street Journal, you are incorrect, dollar and commodities prices are not gaining ground together, though they DO seem to be casting off the shackles of their typical inverse correlation. The headline should have read: "Dollar's correlation with some commodities appears to have weakened over an incredibly specific and short period of time." Color me underwhelmed. If this trend keeps up for all of 2010, okay, then you've got something. You need look no further than my disclosure at the end of this post to determine why I'm a little ticked off, but more than anything I find this amazingly bizarre. The Wall Street Journal Reports today that crude prices rallied, despite news that oil inventories ROSE by 1.3 million barrels in the week ended January 1, 2010. Yep, that's right, supply went up, demand stayed the same, and the price somehow increased. I know, you say, perhaps it's because of a weakening dollar, a la my post from Monday. Actually, as it turns out, the dollar went up yesterday, and started this morning off more or less sideways (depending on which currencie[s] you're using as a dollar barometer). So if anything, all else being equal, I would have expected the price of oil to come DOWN because of the dollar's upward motion. Truth be told, oil only jumped something like 1.7%, and weird price movements aren't anything new, but what strikes me as bizarre is how absolutely backwards this is. Typically, announcements of these sorts cause commodities traders to freak out, but usually its in the (supposed) correct price direction. For example, in the spring and summer you'll often hear about weather services predicting the possibility of a rough hurricane season, and suddenly the price of November Orange Juice will go up 40%. In a way, this is a self fulfilling prophecy; traders are trading on the idea that other traders will be trading on the idea of an orange shortage and voilá, your price correction is over-amplified, but in the correct direction. Call it being overcautious. But to have prices move against what is just very basic economic supply and demand, with seemingly no other cause in sight, really leaves me scratching my head. Let's wait and see how this plays out. "Oil prices moved [up/down] on reports of global reserves potentially [shrinking/growing]. Also contributing to oil's movement was expectation of the dollar's [weakening/strengthening]." Now where this observation gets interesting is in determining which variable is dependent on which. The obvious interpretation is that the value of the dollar is driving oil prices. That said, another way to look at this, one that is more interesting and perhaps more fiscally frightening (assuming you're American) is to flip the causation and hypothesize that the value of the dollar itself is being driven by the price of oil. Consider, the United States of America runs on oil. No single thing (I'd use the word "factor" but it didn't seem broad enough) affects the overall state of the American economy as does the price of oil. Every facet of our commerce, from personal transportation, to air travel, shipping, manufacturing, even the generation of electricity, all of it relies on Texas Tea. Now, assume for a moment that as other economies begin to emerge, creating their own demand for oil and thus disrupting what was previously a largely two-way trade channel (dollars go to the middle east, oil comes to the land of the free), the value of oil as a commodity begins to have an effect on the very means by which it is purchased. I called the above example extreme for a reason; it is. More likely than not, in today's economy such a sale would have a more immediate effect on the commodity markets than the currency, but the point is valid. As nations other than the United States become more involved in the global oil trade, the repercussions of such trade can only have a more profound effect on the value of the currency in which oil is priced. And that would be the dollar. Since the dollar's value is unfixed, the more oil becomes the basis of world commerce, the more the dollar's value relies on how much oil it can purchase. I wouldn't be at all surprised, one day soon, to hear a loud, southern congressmen proclaim to a captivated populace that we "shall not crucify mankind upon a cross of oil." I don't know, maybe the metaphor doesn't work as well with a liquid. *I chose Swiss Francs because of the currency's relative stability. If I had chosen another currency, say, British Pounds, that country's own financial turmoil would have had a more dramatic effect on the quote given and would have been less reliable as a proxy for the Dollar's value. In other words, the Swiss Franc, in my mind, is the best benchmark for a currency's true value, as the geopolitical fallout of some other country is relatively minimized by the Swissie's historic stability. While the world is awash in resources to teach you all about stocks, bonds, and mutual funds, for whatever reason, there is a dearth of clear, accessible information out there about commodities investing. Case in point, if you can believe it, I actually had to purchase a physical book to really learn how the commodities markets function and how I, or any other individual investor, can participate in these markets. Shocking, I know, right? To address this, Asset Prime, in addition to our ongoing commodities insight and analysis, will be running an educational series called "Commodities 101" which seeks to provide the average investor with the information she needs to understand the commodities markets and how to participate. We'll try to cover as much ground as is possible while keeping things short, accessible, and (hopefully) entertaining. How does one invest in commodities? If you were one of the five people in my immediate family who used to occasionally read this blog, you will notice that I have done away with all the old content relating to stocks and index funds and what have you. Going forward into the new decade*, this will be a blog focusing on commodities. Certainly stocks and their markets will factor in, but I decided to wipe the slate clean of my old style posts about P/E and ROE in favor of a more specialized focus on a somewhat neglected asset class: commodities, the most prime of all assets. So happy New Year, commodities! *Yes, I know that technically the new decade doesn't start until 2011, but I'm going to call 2010 the beginning of the new decade. Hey, if Pope Gregory had been a computer scientist, then 2010 would indeed be the beginning of a new decade. So there.